Souvenirs from around the world. 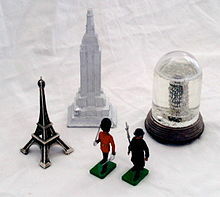 Clockwise from top, Empire State Building, New York City, New York, USA; Leaning Tower of Pisa, Pisa, Italy; Queen's Guards, London, United Kingdom; Eiffel Tower, Paris, France. From French souvenir (字義どおりに “memory”); compare memento. An item of sentimental value, to remember an event or location. (transitive) To take (an article) as a souvenir, especially illicitly, for example during wartime.